Things are incredibly tough for Barbara right now. Coming off the Death of the Family arc, where she had to go toe-to-toe against Joker once again, facing the Clown Prince of Crime for the first time since he left her paralysed all those years ago, she’s gone from one soul-destroying moment to another. First there was the murder of her brother Jim Jr at her own hands. Of course, he kind of deserved it since he was clinically insane and wanted to kill her and his parents, but that doesn’t take away from the emotional impact of the whole event. And then, as you can see from this awesome cover above, Barbara has lost yet another person close to her. It is no surprise then that she is kind of an emotional wreck right now and things are not looking to improve. At all. 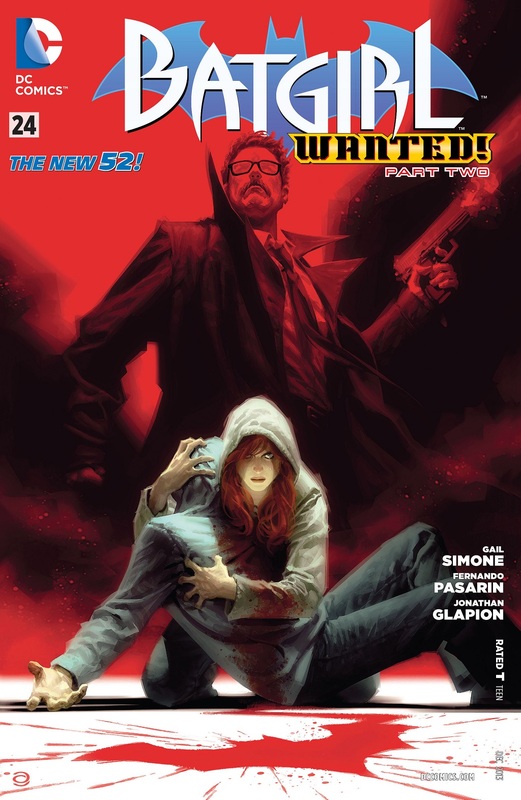 When this issue starts, we are back where the previous issue left off, the big standoff between the GCPD and Barbara and Ricky and Rolo and the gangleader Tyrell. It was a mess of a situation then, and it is a mess now, except for the fact that Ricky is dead, or close to it. And once Barbara is able to get out of the place, with the GCPD hot on her heels, things don’t get any better, not by a long shot. Its one emotionally-twisting moment after another for her. And we begin to learn just what Charise Carnes aka Knightfall is planning with all the high-tech weapons hardware that she has been flooding the streets of Gotham with for a while, arming the gangs and creating a, practically, situation of terror. This is where a lot of the pieces from the previous issue begin to fall into place, and Knightfall’s return to the series finally starts to make sense (although yeah, this is only the second issue with her return so things haven’t been confusing, but explanations are always nice). Gail knows how to write a story that moves you emotionally and has a significant impact. She’s done it repeatedly throughout the series and this new issue is no different. This entire arc might be called “Wanted” but what it really is, is Death of the Family in micro, focusing on just Barbara and her actual family outside of Batman and his students, ex-students or otherwise. This entire series right now is about how Barbara is beginning to lose all the pieces of her family and Gail doesn’t hold back in that regard. Since Barbara is one of my favourite characters in comics, it really saddens that she is going through such an emotional wringer. And that is a mark of how well she is written. It speaks to Gail’s writing skills really. Given the way that this issue, I’m really anxious as to how things are going to move forward in #26. Now if only #25 wasn’t a Zero Year tie-in! Fernando Pasarin outdoes himself once again for this issue. I love his pencilwork and how he draws his characters. They sometimes look a little too similar to each other, but that’s a minor point, and nothing particularly damning. And the way that he keeps Gail’s script flowing was just great. There are lots of little touches in his artwork that reinforce the whole emotional angle that Gail is going for, and I love the harmony between the two. Of course, that’s not to say that inker Jonathan Glapion, another fantastic artist, and colourist Blond aren’t doing their job. They most assuredly are. Visually, these three make Batgirl as iconic a book as with the team behind Scott Snyder’s Batman. One great issue after another. And finally, Alex Garner just rocks with the cover art. The one for the previous issue was pretty damn excellent and so is this one. As a friend said, it subtly references the Batman: A Death In The Family one-shot from yesteryears, the issue that saw Jason Todd being murdered by the Joker in cold-blood. This one is a really great piece of artwork and I hope that Alex has a long and fruitful run on this title. More Batgirl: Vol.1, Vol.2, #23. Posted on October 9, 2013, in Comics Reviews, Review Central and tagged Alex Garner, Barbara Gordon, Batgirl, Comics, Comics Reviews, Commissioner Gordon, DC Comics, Fernando Pasarin, Gail Simone, Jonathan Glapion, New 52, Review, Review Central, Superheroes, Vigilantism. Bookmark the permalink. 13 Comments.